Great shoe with added style of laces. I like these shoes as they give a very relaxed fix compared to some higher end road shoes, with the flexibility of the laces. You aren't left wanting for a stiffer sole in out out of the saddle during hard efforts, they do require a little adjustment to get the fit correct but once you do there great. I like the color the reflective model adds a bit of style to your kit, I find this shoe great as I tend to have an odd fit with pressure on the top of my foot but the laces give me the ability to really fine tune the fit. If your thinking of purchasing these I highly recommend you do. Sole is as stiff as you'd expect from a high end shoe, power transfer to the pedals feels great. They can feel a little tight at the front of the foot at first but they break in after a while. Laces offer great customization of fit. I absolutely love my Empires. I upgraded form a pair of Republics and had high expectations for these given the price. They exceeded all of my expectations in fit, comfort and style. Would absolutely recommend! Comfortable shoes for long, steady rides. This shoes is very comfortable and the laces allow for precise fit. The adjustable arch support in the foot bed is excellent. Not sure how this shoes will perform in racing, especially sprinting and crits, as it's hard to get it to fit tight. I use these shoes for 50 mile rides a few times a week. They are very comfortable. I was a little hesitant to order shoes online, just because I didn't know how they'd fit, but these shoes fit perfectly (I have fairly narrow feet). They are super light, and have a very stiff sole. The laces really add to the snug fit. And they are beautiful! I bought the silver ones, and the finish glows in low light, almost like they have their own light source. All in all, a fabulous shoe! These giro road shoes are the best comfortable shoes in the market. Not to mention if you ride in the evening the reflector material is a safety feature for vehicles to see you. These are some of the lightest shoes i have worn for cycling. I bought the black version and I think they look and feel great. I was at the store and tried on the Sidi's as well as the Fizz's with the Boa system but these were by far the most comfortable and best looking. I love the laces as you can fine tune your adjustment, if you have a tight area, just loosen up the laces a little. Another great thing about these is they clean up really easy. The material they are made of almost has a rubber feel to it so I literally just hose them off when I am hosing off my bike. I highly recommend these! Giro outdid itself. Light, comfortable and well made road cycling shoe. The only dislike is they run small. So if you wear a size 10, order 10 12 Europe equivalent. Very comfortable and come with supports for anyone with external or internal knee issues. Its nice to get back to a lace-up design. Additionally, the outer is reflective, which helps with visibility. Very important with todays driving style. I love the shoes, but I've got just slightly wide feet that spread out over a long ride. These shoes get a little cramped, making my toes fall asleep. It's bearable, but I just wish there was a little more space in the toe box. I took a shoe horn and tried stretching the toe box out, it helped some but may need to keep the shoe horn in there for a few days to get the upper to stretch fully. The adjustibility of the laces is wonderful. Feet a little tight and your arch higher than usual? You can loosen the middle laces and still have a comfortable fit. The heel cup is perfect and with the eyelets you can really lock your feet into the shoe. Awesome shoes, stiff sole, lightweight, understated graphics... That's pretty much it, all I'm looking for in a shoe! The best shoe I ever bought! I ride 120- miles a week and could not be happier with these shoes! No pain,no hot foot. Definitely an eye catcher and well made shoe for any event. 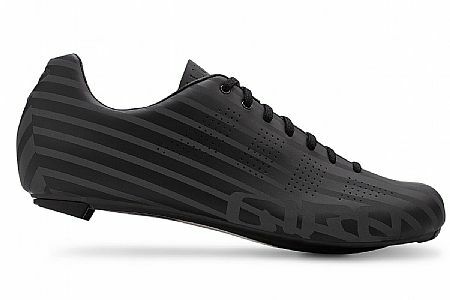 Have been using these Giro 2014 Empire AC road shoe for past three weeks (criterium and club rides) and are very comfortable. Definitely made a big difference on the hills lightweight and snug fit. The classic look also brought a lot of attention to fellow cyclists. Would recommend to anyone! Excellent fit and performance is durable. I started with lace up shoes with wooden soles you nailed cleats to. These shoes are like slippers with stiff soles. I like that you can sans the last eyelet to use your ankles better. I'm a road bike rider, and have owned shoes from a number of different brands-Sidi, Fizik, Diadora. These are extremely light, and very comfortable. After a hilly 200k ride, no hot spots or foot discomfort. These shoes are cut small and a lot little closed in. They look great. I am a 10 normally in regular shoes. I returned these and got the Giro Slx Empire. Love them. I got the 44. 5 11 US men's. They fit good and are the most comfortable shoes I've ever had I wire Sidi Ergo for years in 44.5 but these are more comfort. I have a wide foot so stretched these out gently with a wooden spoon when I got them. The slx is super light and comes with a variety of insole. I would recommend these for comfort and lightness and adjustability and go up at least a half size. I don't wear anything else since I got my Giro Empires. The Empire ACC works for me. I like that adjusting the laces makes the fit more customized. I don't think about the shoes or my feet while riding. They're lightweight, stiff and comfortable I like the looks too. Best shoes I've tried, and I'm picky.